(128 pages) – Why do 9 out of 10 children raised in Christian homes leave the Church? – Why do many professing Christians show little or no evidence for their faith? – Why do 80-90% of those making decisions for Christ fall away from the faith? For decades, the world’s most popular gospel message has been drawing the lost by promising God’s wonderful plan for their life. 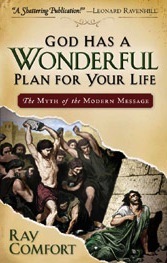 But behind the facade of the “wonderful plan” message is the reality of the trials, temptation, and persecution that Jesus promised. How can we reconcile the two? 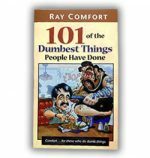 In this life-changing book, best-selling author Ray Comfort explores whether this common gospel approach aligns with real life — and with Scripture. The vital biblical principles he reveals will force you to reexamine your ideas about the gospel — and will teach you how to reach unbelievers the way God intended. A must-read for all who care about the lost. “I served Dr. Bill Bright as his theological editor, and was privileged to work with him for seven years . . . Before you begin chapter one of this book, let me ask you to set aside any preconceived thoughts you have about personal evangelism and judge everything you read according to the Scriptures.” —FROM THE FOREWORD BY JOHN BARBER PH.D.
Be the first to review “God Has A Wonderful Plan For Your Life (Book)” Click here to cancel reply.